maple bacon and beavertails: she thinks it's hers..
this is the only thing consuming me at the moment. i don't know how you poor people suffer through this year after year. i'm pretty positive chuck norris is doing roundhouse kicks to my face. yes, i am whiny and yes, i'm perfectly content with my whininess (just made that word up). so of course i hit up pinterest for an easy brownie recipe. louloubirdie is obsessed with my mixer, she has now asked me for one for her birthday. i told her i'd buy her one when she moved out as a housewarming gift. geez, she has completely taken it over. but i guess i shouldn't complain, she's a great baker! 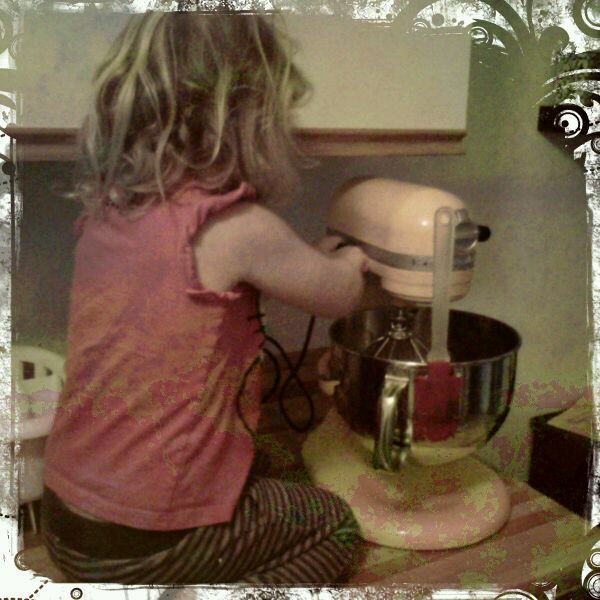 how many three year olds do you know that knows most ingredients used in baking, can determine the different cups for measuring, and knows how to use the mixer even scraping the sides. i don't do much baking - i just assist her. it's great bonding time! the brownies turned out delicious, minor fail on the 2-bite part. edible none-the-less.